"I can do things I never would have even tried before!" When I received the email about the Back to School Transformation, I was ready to go for it. It has been an awesome experience. Besides the personalized attention from the staff, there has been great support from the other participants. We encourage each other. No matter who wins the trip to Las Vegas, everyone is a winner in this group, because we have all gained a new perspective on what it means to be healthy. For me this experience is about total wellness. Yes, I came into it wanting to lose some weight, but even more than that, I wanted to feel healthy and strong. That is how I am feeling. I can do things I never would have even tried before. I am stronger! As to weight loss, we all know muscle weighs more than fat. I have lost a few pounds, but more significantly, I have lost nearly two inches around my waist, dropped two pants sizes (almost three), and my body fat has gone down, while my muscle mass has gone up! My goal is to keep going- get stronger, build muscle mass, and decrease body fat. 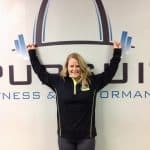 Thank you Pursuit Fitness and Performance!